Jessica Mein’s work reflects the tension between representation and materiality of the image, and her interest in the already misaligned and ‘tropicalized’ Modernism in Latin America. Mein’s focus on urban elements that are nearly extinct, such as the structures and posters and billboard remains, hemp bags once manually impressed, bleached and nearly erased images, is rooted on an investigation into the production and distribution of images in the urban spaces, and our resulting mental and physical relationship to these processes and materials. The formal qualities of these “quasi-images” and constructions that are nearly ruins are echoed in her videos, wall works as well as in the precarious urban structures that support images in a large scale. The supporting elements become as important as the deconstructed images. In a constant oscillation between surface and support, representation and abstraction, construction and its deconstruction, dismantling, or even the sabotaging of her own pieces, Mein’s exploration goes from the micro scale of the textile fibers, books, small collages and cuts in her videos, to large spatial structures. Through altering and experimenting the material of her works to its most basic architectures, the artist questions the authority and mechanization of the image and its surroundings. THE DAILY PIC: At Simon Preston, Mein's abstractions don't hide the fact that a canvas is made from ... canvas. THE DAILY PIC (#1640): Jessica Mein’s solo show of abstractions, at Simon Preston Gallery in New York, triggered a new thought in me: It suddenly occurred to me that the first sophisticated abstract works that most of us see, as children, are textiles. Agnes Martin comes to mind – but suddenly she’s a maker of gorgeously marked stretched cloths. Anni Albers comes to mind, too, as a rare modernist who admitted that fabric was were it’s at. Jessica Mein, Obra Onze, 2013, acrylic medium on canvas and wood, 15 3/4 x 23 x 1 1/2". When São Paulo’s ban on outdoor advertising went into effect in 2007, it left the city’s billboards looking something like Jessica Mein’s paintings: sun-blanched color fields with the scaffolds showing through, like perspective grids held up to the sky. In Mein’s case, the scaffolds are canvas stretchers, exposed not by progressive urban policy but by X-Acto knives and unthreaded hemp. The urgency of these destructive gestures is, at first blush, no clearer in Mein’s work than in any other contemporary canvas-vandal, punishing a medium without caring to indict it for anything in particular. Yet her latest exhibition, “Obras,” sidesteps much of the preciousness and vacuity of this vogue by turning it toward a history of blanked-out spaces. Obra means both artwork and construction site, and Mein intends both senses here—telescoping urban and pictorial space in what appear to be modest abstractions on distressed canvas. Their geometric motifs, in fact, come from sections of now-disused billboards. In the transfer to the stretcher, these graphic fragments assume a waxy, spectral quality, alternatively hovering over the surface of the canvas and sinking some inches below it, as the slashes and unwoven sections compete to occupy the foreground. This oscillation might be an old trick—and indeed the exhibition is almost mobbed with references, from Barnett Newman’s zips to Ellsworth Kelly’s shaped canvases to Agnes Martin’s parallels—but at their best moments Mein’s paintings are as oblique as the exhibition’s architectural intervention: a vertical slipshod slice through one of the gallery’s walls, aligned with a weftless “zip” that runs through a cantaloupe-colored canvas. As many commentators noted, when the billboards came down in São Paulo, the favelas beneath them came to attention. Mein’s excised canvases might not have that degree of social potency, but they’re admirable for seeking contact with a history beyond painting’s false endgames. Like the affichistes of nineteen-fifties Paris, this young Brazilian uses posters and billboards as the raw material for abraded abstract collages, which she calls obras, a Portuguese word that means both art work and construction sites. In many, she has meticulously unthreaded the canvas or hemp that supports the abstraction, leaving delicate see-through stripes. Some of the pieces are too complex for their own good; one sits on the floor, another spans a crevice pointlessly created in a wall for the purpose. But the best works collapse the boundary between found and made. Through Dec. 22. Jessica Mein, Billboard, 2010, still from a video animation, 4 minutes 15 seconds. “Verso Reverso,” Jessica Mein’s solo debut in New York, has its origins in the outdoor advertising ban enacted in her hometown of São Paulo four years ago. In her collages and animations, the promotional imagery of discarded billboard sheets serves as the basis for a sustained exploration of the paradox of repetition. Approaching Blue Windows, 2011, the viewer passes through a series of teasing discrete resolutions: The collage appears first as muted, high-contrast fragment, showcasing the sharp, unambiguous lines of a commercial photograph depicting a modern building in front of a blue sky. But the sheets are hung loosely, and on a closer look their creases and folds reveal the regularity of the half-tone printing process, in which dots of cyan, yellow, and magenta are closely gridded. On this surface the artist has punched out holes and reglued their respective disks in patterns mirroring the printing process. Using sheets that were discarded for production faults, Mein mingles those mechanical errors with her handmade interventions, the repeated forms subtly changed by their very reappearance. 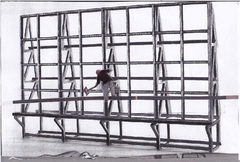 In an animation on the opposite wall, Billboard, 2010, collaged and overdrawn stills from a video show a worker mounting a billboard. In the jerky stitching of the animation, objects keep diverging and reframing: The ladder loses rungs (at times the worker hangs in space with Buster Keaton resolve), the billboard sheets disappear and reappear. In its playfulness and emphasis on process, the parallel installation of an animation and the commonplace raw ingredients it is made of recalls William Kentridge, and for both artists meaning is built up through the reappearance of images, changed at every step and coalescing into a coordinated effect.